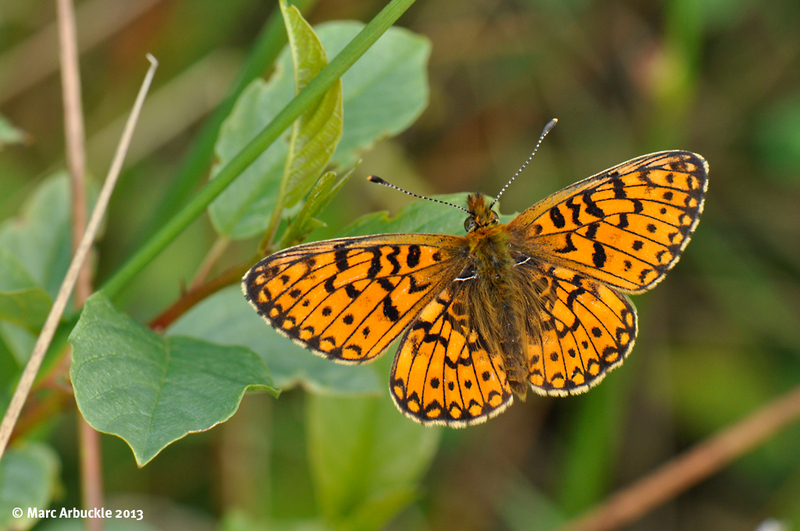 This little orange firecracker is a Small Pearl-bordered Fritillary Boloria selene, a male I believe, photographed on the 9th June at Bentley Wood. This was one of the first butterflies I photographed last May when I got my macro lens and I can’t tell you how much I was looking forward to viewing the results. Particularly as this was a new species for me. What a disappointment then to discover the vast majority were either blurred or just slightly out of focus. To be fair I did manage to get a few decent shots, one of which was shortlisted for the Wiltshire Wildlife Trust’s 50th anniversary photographic competition, but believe me that was more down to luck than judgement. Being new to photography I used the automatic settings and let the camera make all the decisions for me. Unfortunately it made all the wrong ones. After a bit of thinking it became clear that due to the poor light – woodland glades are surprisingly dark even on a relatively bright day – the shutter speed was just too slow to freeze the subject and this is why the wings were blurred. This can happen if the exposure drops below 1/60 when shooting without a tripod and flash. As for the lack of focus, this was a side-effect of the camera opening the lens all the way to allow as much light as possible to reach the sensor. Understandable, due to the lack of light but on a fast lens this seriously reduces the depth of field (DOF), the area actually in focus, which when wide open at f/2.8 is very narrow indeed, we’re talking millimetres. A year later I’ve learnt to shoot using aperture priority mode, to watch my shutter speed, pay attention to the aperture to control the DOF and to focus manually. I still take quite a few iffy photos but at least it’s me making the errors now not the camera. This photo was taken at ISO 200, with a shutter speed of 1/60 and an aperture of f/8. That’s a stunning shot Marc! Thanks Lucy. It’s a lovely butterfly.